US futures are pointing to a higher open today after ending lower on Wednesday. Investors shrugged off global trade war concerns following President Donald Trump’s decision to appoint Larry Kudlow as his top economic advisor, replacing Gary Cohn. A week after the implementation of steel and aluminum import tariffs, markets fear from a report that Trump is considering imposing tariffs on up to $60 billion of Chinese imports in the technology and telecommunications sectors. 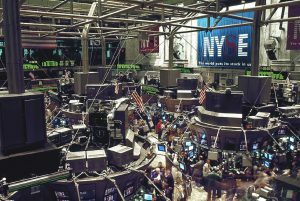 The S&P futures gained 0.06% to 2,751.50, Dow futures rose 0.23% to 24,828 and Nasdaq advanced 0.01% to 7,033.75. Elsewhere, shares at Asian markets closed broadly up on Thursday, while European stocks are trading higher. On the European economic front, data from Insee showed that France’s consumer price inflation eased to 1.2% in February from 1.3% in January. The European Automobile Manufacturers’ Association report revealed that Europe’s new car registrations grew 4.3% on year in February after rising 7.1% in January. The Turkish Statistical Institute data showed that unemployment rate rose to 10.4% in December from 10.3% in November. The Statistics Denmark data revealed that Denmark’s producer price inflation eased to 1.1% in February from 1.4% in January. On the Asian economic front, data from Statistics New Zealand showed that New Zealand’s GDP advanced 2.9% on year in the fourth quarter of 2017, after rising 2.7% in the third quarter. The Department of Statistics data revealed that Malaysia’s unemployment rate rose to 3.4% in January from 3.3% in December. The Statistics Bureau data showed that Indonesia’s exports advanced 11.76% on year and imports soared 25.18% in February. Indonesia’s trade balance showed a shortfall of around $110 million in February compared to a surplus of $1.26 billion last year. On March 14, US ended lower, with Nasdaq down 0.19% to 7,496.81. Dow fell 1% to 24,758.12, and S&P 500 tumbled 0.57% to 2,749.48. Trump’s comments have renewed geopolitical concerns that hurt the Wall Street. Traders were worried that the Federal Reserve would lift interest rates by a half-point at the next week’s meeting. Meanwhile, key economic data that will be released today include the Labor Department’s jobless claims, Empire State manufacturing survey, Federal Reserve Bank of Philadelphia’s business outlook survey, Energy Information Administration natural gas report, Treasury International capital data, Fed balance sheet, and Fed money supply. On the corporate front, Alexion Pharmaceuticals (ALXN) stock grew 5.58% in the premarket after positive blood disorder drug trial results. Walt Disney (DIS) stock rose 0.29% in premarket after putting two executives in line to succeed CEO Bob Iger. Supervalu (SVU) stock increased 3.25% in premarket after it plans to shed Farm Fresh stores. Solid Biosciences (SLDB) stock plunged 58.57% in premarket after FDA put a muscular-dystrophy treating clinical study on hold. Solid Biosciences stock plunged 58.57% in premarket after FDA put a muscular-dystrophy treating clinical study on hold. On the earnings front, key companies reporting earnings today include StarTek (SRT), Genesco (GCO), Superior Industries International (SUP), Jabil (JBL), Adobe Systems (ADBE), Harte Hanks (HHS), Avid Technology (AVID), ChipMOS Technologies Bermuda (IMOS), Pctel (PCTI), Broadcom (AVGO), and Dollar General (DG). Crude oil futures is up 0.54% to $61.29. Gold is trading down 0.24% to $1,322.40, and silver is down 0.28% to $16.49. On the currency front, the US dollar is trading down 0.36% at 105.93 yen. Against the euro, the dollar is down 0.11% to $1.2352. Against the pound, the dollar is down 0.22% to $1.3933.